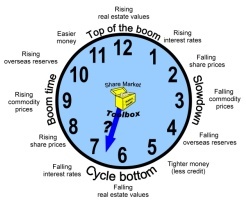 This month's eNews email is going to all Toolbox Members as normal, and to some non-members, and includes very useful information about the subject of investing in cyclical stocks. This includes consideration of the infamous Investment Clock (pictured at right). More details are included below. The ASX again invited me to write a contribution for the monthly ASX Investor Update newsletter (on behalf of the ATAA) to be published on Tuesday 9th October. You might know that I was also asked to contribute to the June issue evaluating four "mum and dad" stocks, and the August issue on the topic of Price Breakouts. I also have a special web page with links to key information from these ASX Investor Update newsletters. And you can see past editions of all these newsletters at the ASX web site. They are sent each month to 220,000 registered free subscribers to the ASX service. For the October ASX Investor Update newsletter I was asked to explain how we could use technical analysis to identify cyclical stocks, and to chart some cyclical stocks against their relevant sector index. Instead of doing this, I have written some material which could be a little controversial. It basically explains how it is difficult to justify spending a lot of time analysing sectors, and the economic cycle, because it can be complex, and very vague, involving a lot of assumptions (guesswork). Anyway, you should read the article when it is published by the ASX on 9th October, or read the same material in my new eBook Article ST-6310 (see the link below). A new web page on Investing in Cyclical Stocks. Article ST-6310, "Investing in Cyclical Stocks"
(or see the free page 1). There are now a total of 124 Articles in this collection of eBook Articles - a total of 547 pages of information! You can see the Table of Contents for all Articles here (recently new or updated ones are highlighted), and the Detailed Toolbox Index here. Since October 2008 I have accumulated quite a collection of eBook (PDF) Articles on three subject areas - Share Trading/Investing, Technical Analysis and BullCharts software (actually more than 540 pages of material in more than 120 articles). These Articles are invaluable for both new and experienced investors and traders. I am now writing brief monthly notes in this eNews email to highlight specific Articles on targeted topics. I am also writing new Articles and updating existing ones as required.